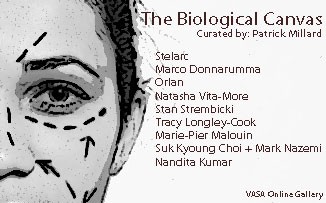 The Biological Canvas parades a group of hand-selected artists who articulate their concepts with the body as the primary vessel. Each artist uses the body uniquely, experimenting with it as the medium: body as canvas, body as brush, and body as subject matter. Despite the approach, it is clear that we are seeing new explorations with the body as canvas beginning to emerge as commonplace in the 21st century. There are reasons for this refocusing of the lens or eye toward the body. Living today is an experience quite different from that of a century, generation, decade, or (with new versions emerging daily) even a year ago. The body truly is changing, both biologically and technologically, at an abrupt rate. Traditional understanding of what body, or even what human, can be defined as are beginning to come under speculation. Transhuman, Posthuman, Cyborg, Robot, Singularity, Embodiment, Avatar, Brain Machine Interface, Nanotechnology …these are terms we run across in media today. They are the face of the future – the dictators of how we will come to understand our environment, biosphere, and selves. The artists in this exhibition are responding to this paradigm shift with interests in a newfound control over bodies, a moment of self-discovery or realization that the body has extended out from its biological beginnings, or perhaps that the traditional body has become obsolete. We see in the work of Orlan and Stelarc that the body becomes a malleable canvas. Here we see some of the earliest executions of art by way of designer evolution, where the artist can use new tools to redesign the body to make a statement of controlled evolution. In these works the direct changes to the body open up to sculpting the body to be better suited for today’s world and move beyond an outmoded body. Stelarc, with his Ear on Arm project specifically attacks shortcomings in the human body by presenting the augmented sense that his third ear brings. Acting as a cybernetic ear, he can move beyond subjective hearing and share that aural experience to listeners around the world. Commenting on the practicality of the traditional body living in a networked world, Stelarc begins to take into his own hands the design of networked senses. Orlan uses her surgical art to conceptualize the practice Stelarc is using – saying that the body has become a form that can be reconfigured, structured, and applied to suit the desires of the mind within that body. Carnal Art, as Orland terms it, allows for the body to become a modifiable ready-made instead of a static object born out of the Earth. Through the use of new technologies human beings are now able to reform selections of their body as they deem necessary and appropriate for their own ventures. Not far from the surgical work of Orlan and Stelarc we come to Natasha Vita-More’s Electro 2011, Human Enhancement of Life Expansion, a project that acts as a guide for advancing the biological self into a more fit machine. Integrating emerging technologies to build a more complete human, transhuman, and eventual posthuman body, Vita-More strives for a human-computer interface that will include neurophysiologic and cognitive enhancement that build on longevity and performance. Included in the enhancement plan we see such technologies as atmospheric sensors, solar protective nanoskin, metabrain error correction, and replaceable genes. Vita-More’s Primo Posthuman is the idealized application of what artists like Stelarc and Orlan explore with their own reconstructive surgical enhancements. The use of body in the artwork of Nandita Kumar’s Birth of Brain Fly and Suk Kyoung Choi + Mark Nazemi’s Corner Monster reflect how embodiment and techno-saturation are having psychological effects on the human mind. In each of their works we travel into the imagined world of the mind, where the notice of self, identity, and sense of place begin to struggle to hold on to fixed points of order. Kumar talks about her neuroscape continually morphing as it is placed in new conditions and environments that are ever changing. Beginning with an awareness of one's own constant programming that leads to a new understanding of self through love, the film goes on a journey through the depths of self, ego, and physical limitations. Kumar’s animations provide an eerie journey through the mind as viewed from the vantage of an artist’s creative eye, all the while postulating an internal neuroscape evolving in accordance with an external electroscape. Corner Monster examines the relationship between self and others in an embodied world. The installation includes an array of visual stimulation in a dark environment. As viewers engage with the world before them they are hooked up simultaneously (two at a time) to biofeedback sensors, which measure a selection of biodata to be used in the interactive production of the environment before their eyes. This project surveys the psychological self as it is engrossed by surrounding media, leading to both occasional systems of organized feedback as well as scattered responses that are convolutions of an over stimulated mind. Marco Donnarumma also integrates a biofeedback system in his work to allow participants to shape musical compositions with their limbs. By moving a particular body part triggers sounds and increases volume depending on the pace of that movement. Here we see the body acting as brush, literally painting the soundscape through its own creative motion. As the performers experiments with each portion of their bodies there is a slow realization that the sounds have become analogous for the neuro and biological yearning of the body, each one seeking a particular upgrade that targets a specific need for that segment of the body. For instance, a move of the left arm constantly provides a rich vibrato, reminding me of the sound I envision emanating from Vita-More’s solar protective nanoskin. Our final three artists all use body in their artwork as components of the fabricated results, acting like paint in a traditional artistic sense. Marie-Pier Malouin weaves strands of hair together to reference genetic predisposal that all living things come out of this world with. Here, Malouin uses the media to reference suicidal tendencies – looking once again toward the fragility of the human mind, body and spirit as it exists in a traditional biological state. The hair, a dead mass of growth, which we groom, straighten, smooth, and arrange, resembles the same obsession with which we analyze, evaluate, dissect and anatomize the nature of suicide. Stan Strembicki also engages with the fragility of the human body in his Body, Soul and Science. In his photographic imagery Strembicki turns a keen eye on the medical industry and its developments over time. As with all technology, Strembicki concludes the medical industry is one we can see as temporally corrective, gaining dramatic strides as new nascent developments emerge. Perhaps we can take Tracy Longley-Cook’s skinscapes, which she compares to earth changing landforms of geology, ecology and climatology as an analogy for our changing understanding of skin, body and self. Can we begin to mold and sculpt the body much like we have done with the land we inhabit? There is a tie between the conceptual and material strands of these last few works that we cannot overlook: memento mori. The shortcomings and frailties of our natural bodies – those components that artists like Vita-More, Stelarc, and Orlan interpret as being resolved through the mastery of human enhancement and advancement. In a world churning new technologies and creative ideas it is hard to look toward the future and dismiss the possibilities. Perhaps the worries of fragility and biological shortcomings will be both posed and answered by the scientific and artistic community, something that is panning out to be very likely, if not certain. As you browse the work of The Biological Canvas I invite you to engage your creative mind. Look at your life, your culture, your world and draw parallels with the artwork – open your own imaginations to what our future may bring, or, perhaps more properly stated, what we will bring to our future.